YEVGENIY FIKS WAS BORN IN MOSCOW IN 1972 AND HAS BEEN LIVING AND WORKING IN NEW YORK SINCE 1994. FIKS HAS PRODUCED MANY PROJECTS ON THE SUBJECT OF THE POST-SOVIET DIALOGUE IN THE WEST, AMONG THEM: “LENIN FOR YOUR LIBRARY?” IN WHICH HE MAILED V.I. LENIN’S TEXT “IMPERIALISM: THE HIGHEST STAGE OF CAPITALISM" TO 100 GLOBAL CORPORATIONS AS A DONATION FOR THEIR CORPORATE LIBRARIES; “COMMUNIST PARTY USA,” A SERIES OF PORTRAITS OF CURRENT MEMBERS OF COMMUNIST PARTY USA, PAINTED FROM LIFE IN THE PARTY'S NATIONAL HEADQUARTERS IN NEW YORK CITY; AND “ COMMUNIST GUIDE TO NEW YORK CITY,” A SERIES OF PHOTOGRAPHS OF BUILDINGS AND PUBLIC PLACES IN NEW YORK CITY THAT ARE CONNECTED TO THE HISTORY OF THE AMERICAN COMMUNIST MOVEMENT. FIKS'S WORK HAS BEEN SHOWN INTERNATIONALLY, INCLUDING SOLO EXHIBITIONS AT WINKLEMAN GALLERY AND COMMON ROOM 2, BOTH IN NEW YORK (USA); CONTEMPORARY CITY FOUNDATION, MARAT GUELMAN GALLERY AND ARTStrelka PROJECTS IN MOSCOW, AND THE STATE MUSEUM OF RUSSIAN POLITICAL HISTORY, ST. PETERSBURG (RUSSIA); AND THE LENIN-MUSEO, TAMPERE (FINLAND). HIS WORK HAS BEEN INCLUDED IN THE BIENNALE OF SYDNEY (2008); THESSALONIKI BIENNALE OF CONTEMPORARY ART (2007); AND MOSCOW BIENNALE OF CONTEMPORARY ART (2007 AND 2005). 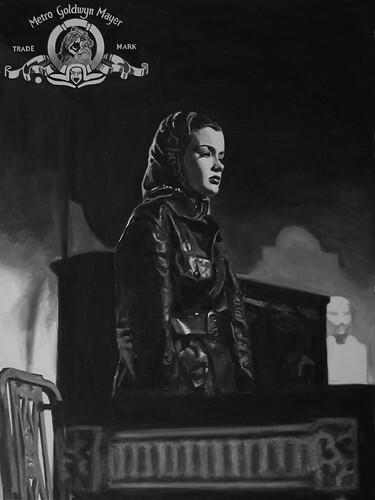 "Song of Russia" is a series of oil paintings based on imagery borrowed from three Hollywood films about Russia that were produced between 1943 and 1944. These films, North Star and Song of Russia, both produced at Metro-Goldwyn-Mayer studios, and Mission to Moscow, produced by Warner Brothers, were created at the behest of US President Franklin D. Roosevelt, and were intended to garner support for the Soviet Union during World War Two by influencing the American public’s perception of the USSR. The films were essentially pro-Soviet propaganda, presenting Stalin’s Russia in a very favorable light. They adroitly appropriated the aesthetics and rhetoric of Stalin’s Socialist Realism of the 1930s and 1940s, and were essentially American embodiments of Socialist Realist motion pictures in terms of both form and content, but produced in Hollywood and sanctioned by F.D.R. himself. The unlikely creation of these films was possible due to timing: they were produced during the hiatus between the anti-Soviet hysteria that followed the October Revolution, and the beginning of the “Cold War” era – a brief moment when the goals of the American and Soviet propaganda machines coincided. What makes the films particularly poignant is that after World War Two, during the period of McCarthyism known as the Second Red Scare, they came under the corrosive scrutiny of the House Committee on Un-American Activities. Swept up by the purported communist infiltration of Hollywood, and the subsequent witch hunts and hearings that were to grip the American entertainment industry for a decade, with reverberations beyond, the creators of these films could never prove that they had received direct orders from the Roosevelt administration to produce these films, since those orders remained classified. As a consequence, many of those involved in producing these films were blacklisted. The painting series, “Song of Russia,” reflects this forgotten chapter of the history of American cinema, and contributes to narratives about the mechanisms and processes of official constructions for the notions of “enemy” and “ally” alike.